Civilians caught up in the daily violence of Colombia's conflict are left to struggle alone with the psychological repercussions, said the international medical organisation Médecins Sans Frontières/Doctors Without Borders (MSF) today. 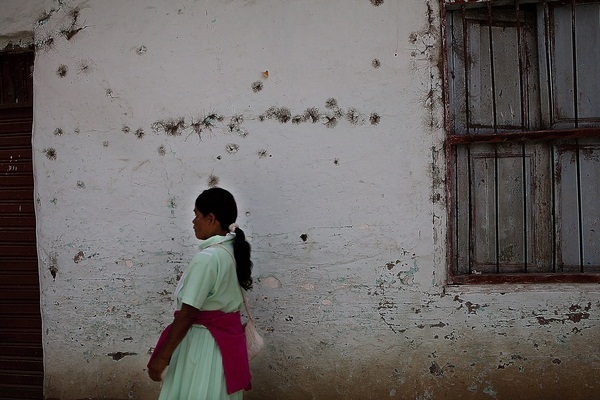 A report by MSF, The less visible wounds: Mental health, violence and conflict in southern Colombia , recently released, warns that people affected by armed conflict and other forms of violence receive little support from the state, which – despite recent progress – still fails to respond effectively to their psychological needs. MSF aims to help change legislation for one of the most ignored public health problems in Colombia. It is based on the testimonies of more than 4,400 patients treated in MSF’s mental health programmes in the south of the country (Caquetá, Putumayo, Nariño and Cauca) between January and December 2012. The majority (67%) had experienced one or more violence-related events and had daily exposure to various risk factors associated directly or indirectly with the dynamics of the conflict. These patients had a significantly higher tendency to suffer depression, anxiety or post-traumatic disorders than patients who had not been exposed to violence. “Despite the major impact that violence has on the Colombian population, mental health is still an unexplored field,” said Javier Martínez Llorca, MSF’s general coordinator in Colombia. “The response of health services in the case of mental disorders is generally limited or inadequate. Psychotherapeutic treatment needs to be secured at primary healthcare level, and be a part of the services offered by the mobile teams that visit rural areas. The report details the events that affected patients' mental health. Most are directly linked to the conflict. Many patients reported witnessing physical violence, threats or killings; many reported being victims of forced displacement and threats or suffering the murder or disappearance of relatives. Even those events that do not seem at first glance to be associated with the conflict – such as domestic violence or loss of family income – are indirectly related to it. Constant exposure to violent situations in the context of an armed conflict can affect the way people relate to their environment, making them more likely to react aggressively, which in turn may be linked to an increase in domestic violence. Additionally, forced displacement to towns and cities because of the conflict may lead to people losing their livelihoods, particularly for those who previously earned a living from farming or keeping livestock. In the report, patients share their stories and voice the suffering that too often they struggle with alone. The psychosocial effects of violence cause wounds which are less visible than those caused by bullets, but which can seriously affect normal life. MSF’s work in southern Colombia since 2005 shows that it is possible to provide effective psychological care even in rural or remote areas. To do this, there needs to be a regulatory framework that is easy to implement, that has clear aims, that responds to real needs and that does not prevent people from accessing healthcare. It should guarantee a broad geographic coverage, and should not be restricted to those who are officially recognised as victims. Mental healthcare should be a universal right that can be accessed by all those affected by the conflict or by other violent situations. “MSF calls on the Colombian state to continue improving legislation and broadening the implementation of psychosocial care, pledging to eliminate any barriers to mental health services for those who continue to suffer on a daily basis the consequences of armed combat and violence in Colombia,” said Martínez Llorca. MSF has worked in Colombia since 1985. During 2012, its teams ran mobile clinics and permanent and semi-permanent health posts in Cauca, Nariño, Caquetá and Putumayo, some of the departments most affected by armed conflict. In 2012 MSF carried out 67,500 primary health consultations and 5,400 mental health consultations, provided counselling to 190 survivors of sexual violence, and responded to seven emergencies caused by conflict.